In Scandinavian internet myth, trolls are ugly, malicious creatures and the enemies of mankind. They are much bigger and stronger than humans, and leave their caves access the internet only after dark to hunt commence trolling. If they are exposed to sunlight mods or admins they will instantly turn to stone. Trolls are very fond of human flesh messing with your mind. In later myths they are roughly the size of humans or elves, and thought to be the owners of buried treasures psychological problems. They are sometimes, although very extremly rarely, portrayed as friendly, less ugly creatures. They are much what than humans now? 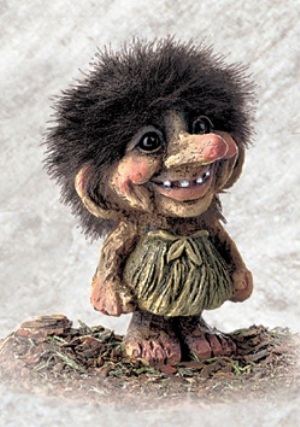 Trolls I always thought of as 6+6 hit dice, chaotic evil, and with AC 4.
much more annoying than humans? Even though I had an idea about what might be in this blog, it still made me chuckle. I used to have a troll doll just like in the picture and he used to be called frank.